We are proud to introduce Faux Mink Bold 0.03 mm diameter eyelash extensions, the thinnest lash we’ve ever made. These volume lash extensions are the key to unlocking daring design opportunities and dynamic depth, texture, lift, and volume without the weight compared to thicker eyelash extensions. Depending on the look you’re trying to achieve, these can be used on their own or combined with thicker extensions. These thin, lightweight lash extensions are ideal for use in Classic Single-Layer™, Volumation®and Hybrid (combination of Classic Single-Layer and Volumation) lash applications. As some of the best lash extensions for volume, you can use them to fill gaps flawlessly using Stacking™ or Multi-Lash Pickup™ volume techniques. Use them to enhance your Perking™ technique in order to maximize lift, density, and texture. Add design focus by transitioning color intensity from light to dark using the Fading™ technique. Take advantage of the thin diameter of these volume lashes to soften and blend multiple lash diameters and colors across the lash line using the Feathering™ technique. Achieve more texture, density, and volume across all application designs by safely applying 0.03 mm, 0.05 mm, and 0.07 mm diameter eyelash extensions to a single natural lash. Faux Mink Bold volume lashes are ideal for use across a multitude of application techniques from Classic Single-Layer™ to Volumation®, or even Hybrid™. 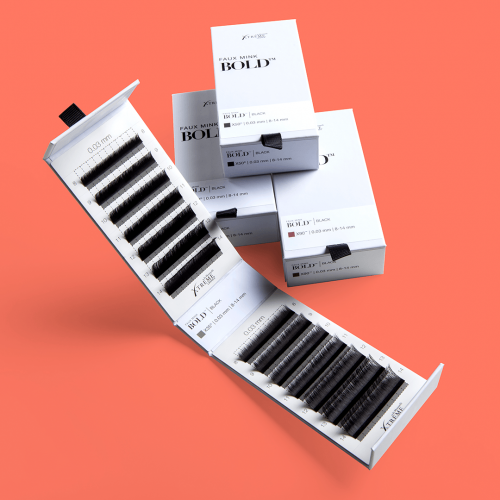 The 0.03 mm diameter enables a Lash Stylist to safely add more lash extensions to a single natural lash, fill gaps at the lash line, and effortlessly enhance advanced techniques such as Feathering™, Fading, and Perking™. These 0.03 mm lash extensions are ideal for volume lash applications. While thicker lash extensions can easily weigh down the natural lash, this thinner diameter allows for the application of more voluminous looks without compromising the comfort of the client and the integrity of the extensions. They can also be used to add natural texture to the lash line when combined with lash extensions of a thicker diameter. The use of eyelash extensions with multiple thicknesses provides a more natural and voluminous look.